United is the latest airline to ditch pilots' paper flight manuals, having announced today that it is distributing 11,000 iPads across all of its Continental and United flight decks. United said in a press release that its new iPad-bearing pilots will use Jeppesen Mobile FliteDeck, "the industry's premier app featuring interactive, data-driven enroute navigation information and worldwide geo-referenced terminal charts. The enhanced full-color, high-quality information display ensures the right information is displayed at the right time." In addition to having less weight to carry in and out of the plane, the weight savings also saves fuel, while reducing the amount of unnecessary paper used and printed by airlines. United states that "a conventional flight bag full of paper materials contains an average of 12,000 sheets of paper per pilot. The green benefits of moving to EFBs are two-fold: it significantly reduces paper use and printing, and, in turn, reduces fuel consumption. "The airline projects EFBs will save nearly 16 million sheets of paper a year which is equivalent to more than 1,900 trees not cut down. Saving 326,000 gallons of jet fuel a year reduces greenhouse gas emissions by 3,208 metric tons." 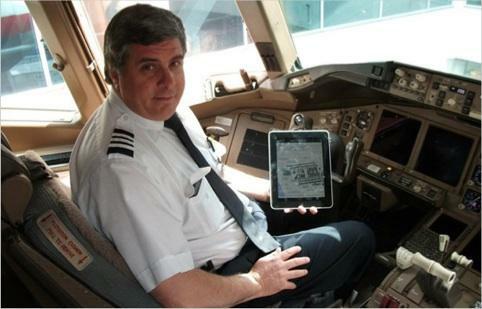 The U.S. Federal Aviation Administration approved the use of iPads to replace paper flight bags of navigation charts and system manuals this spring, with Alaska Air being the first carrier to adopt Apple's tablet. Other airlines have also rapidly adopted iPad flight bags, including American Airlines and Delta. New electronic manuals stored on iPads are popular because they can shed around 40 pounds of paper weight per pilot and are also easier to navigate, read and keep up to date, using hyperlinks, color graphics and automatic updates rather than thumbing through reams of paper and needing to cycle out old pages for new pages as information changes. iPad flight bags are also much cheaper. Alaska Air pilot Jack Long noted he could scrap his $1,414 a year subscriptions to paper maps and charts and replace them with the same maps and charts sent to his two iPads for only $150 a year.